Argan oil is the most precious and the best beautifying product. It is called the liquid gold of Morocco because of its amazing colour and country of origin. The product contains a variety of vitamins, minerals and fatty acids that deppy regenerate skin and hair. Keep on reading to see how it works. How does argan oil treat different skin types? The biggest advantage of argan oil is that it can be used in the care of all skin types. It provides strong moisturising effects as well as maintaining proper level of moisture inside cells. Therefore, your complexion is less susceptible to mechanical and chemical damages. It becomes soft to the touch, firm and healthy. Moreover, using argan oil on oily, combination or acne-prone skin provides incredible effects. It regulates the work of sebaceous glands, reduces sebum secretion and helps overcome acne. What is more, it brightens hyperpigmentation and soothes fine lines. Argan oil has positive effects on mature skin type. Antioxidants fight free radicals and prolong young appearance. Additionally, skin is firmed and resistant to harmful external factors. The care of sensitive and allergy-prone skin will also bring stunning results. Thanks to using argan oil, you will protect your complexion from damages and sooth any irritations. Argan oil in coloured and skin care cosmetics. Argan oil is contained in some coloured and beautifying cosmetics. It can be found in mascaras, eyeliners. As you can see it appears in products that are designed for sensitive parts of your face. Argan oil is also the component of lipsticks and lip balms. This precious substance protects sensitive skin of your lips against frost or strong sun. Make-up removal with argan oil. Argan oil thoroughly removes coloured cosmetics and cleanses facial skin. The product not only purifies but also nurtures skin. Cleansing face with oils is a very popular evening routine. All you need to do is to combine a few drops of argan oil with other oils of gentle properties. Your skin will be clean, nourished and flawless. How does argan oil treat your body? 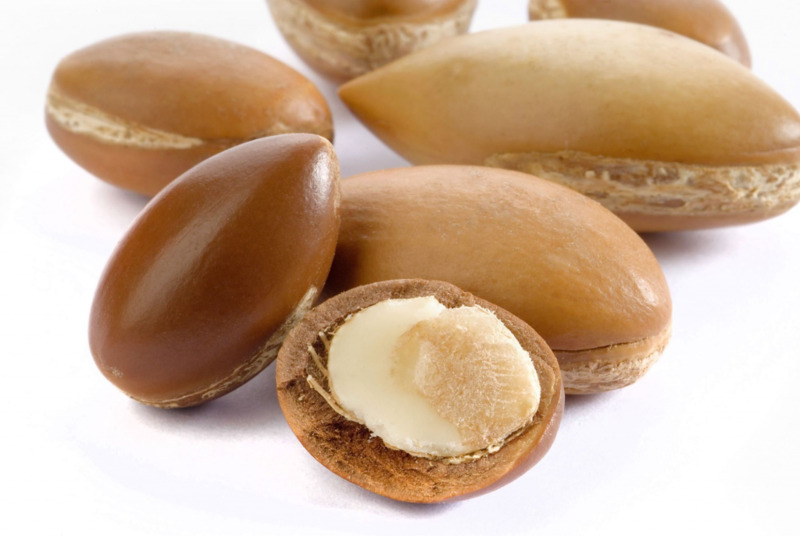 Argan oil is present in cosmetics designed for body care. You will find it in lotions, balms, mists and shower gels. Thanks to such products, your skin will be firm, smooth and thoroughly moisturised. Remember to use cosmetics with argan oil regularly. The best way is to apply it every evening, after taking shower or a bath. What is interesting is that argan oil-based cosmetics can be used both in winter and summer.